Get a glimpse of Aiden's abilities and the world he lives in. Jonathan Morin, creative director on Ubisoft's upcoming sandbox hack-em-up Watch Dogs, took the stage at the PlayStation Meeting last month to show off a few minutes of Watch Dogs gameplay. While the demonstration won many fans over, it's difficult to get a feel for a game's more subtle workings by watching someone else play it. To that end, Morin sat down to discuss a few of the less obvious mechanics at play. Aiden, the game's protagonist, is a very capable individual - we've seen him employ parkour to get around the city quickly, and he's pretty handy with guns and his telescoping baton. His most interesting skillset, however, is his ability to hack ctOS, the CenTral Operating System that links just about every piece of technology in Watch Dogs's near-future Chicago. "All of these electronic devices form a complex, powerful network upon which we have become increasingly dependent," Morin explained. "Now imagine one man taking control of that network." We've seen Aiden manipulate ctOS in two gameplay demos to distract guards, cause traffic accidents, and hijack a train. However, while players are free to abuse the system in any way they wish, their actions will have consequences: collateral damage is tracked by the game's Reputation system. Various actions will have Positive or Negative effects on how people see Aiden as either as a heroic vigilante or a reckless psychopath. This sounds an awful lot like another tacked-on moral choice mechanic, but Morin is quick to point out that Aiden's Reputation won't be so black and white. "We are not building one of those yin and yang systems that always end up feeling gamey and out of place," he says. "Our Reputation System will focus more on how people in our society tend to forge their opinion and this is yet another fascinating subject in relation with our main theme: the influence of technology within our society." In addition to cyberspace, Aiden will have free roam over a number of locations in the real world. The city streets and rooftops are open for exploration on foot, and Aiden can also access some sort of "large under city." 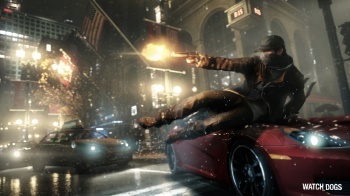 Specific buildings will serve as interior set pieces, though players will be able to trespass into interiors through digital means as well, hacking into and controlling "any computer in the city." We'll get a chance to exploit ctOS for ourselves when Watch Dogs releases later this year for PC, PS3, Xbox 360, and next-gen consoles.